Here is my version of this classic dish – not that I have any claim to being an authority on what is “authentic” Chinese food. I am an authority, however, on what is super incredibly yummy. This rice gets my stamp of approval, with honors. It is better than takeout, and you can enjoy skipping all the mysterious, unhealthy parts of fast food. BY POPULAR DEMAND! You can also check out my recipe for better-than-takeout easy pad thai. And don’t freak out too much, but we love this breakfast fried rice. Prepare 1 cup rice with two cups water in a rice cooker or on the stovetop. Meanwhile, heat sesame oil in a large skillet over medium heat. Add onion, garlic, peas, and carrots. Cook for 5-7 minutes. 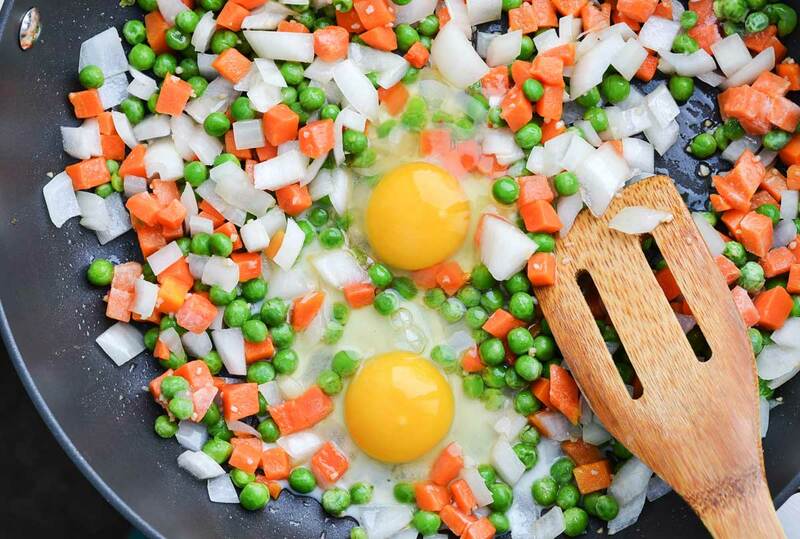 Crack eggs into pan and scramble, mixing with vegetables. Add rice, chicken, and soy sauce to pan. Stir to combine and remove from heat. Can I make this and put it in a crock pot to eat later? If so, do I need to add water or oil or anything? Why do you add two cups of water to one cup rice? Wouldn’t that make the rice soft? And what about frying it – just mix it? Excellent dish! So easy and a family pleaser for sure! We rarely have leftovers as a family of 4. We really enjoy the flavor boost from the sesame oil. What kind of rice do you use? Just enriched grain white rice? I loved this recipe! I will say I changed up the ratios though. I used 1/4 of an onion, not even a full chicken breast. I didn’t measure the veggies but I used frozen diced carrots and peas which worked really well to save a little prep time and they’re pretty cheap at Walmart. I also used butter and gluten free soy sauce. Lol okay so I followed the recipe REALLY LOOSELY- but it got me where I wanted to go lol. Delicious!! I usually allow my rice to sit in the refrigerator until the rice is cold to keep it from being sticky. Also, the fried rice i ate while stationed in Thailand was the best. The rice and eggs and sesame oiled soy sauce are fin.,Add whatever beef, pork, shrimper chicken you choose but right before taking out add halved cherry tomatoes and cucumber slices, warm and eat. I added another egg, added sweet corn kernels, and substituted brown rice. It was amazing! Definitely better than take out!! Will make again. I thought it was pretty good last night (when I cooked it), but the leftovers are delicious. Will definitely make again! As some suggested, I used a bag of frozen peas and carrots and doubled the recipe. I made jasmine rice and put it in the fridge for a few hours. I cut my chicken into cubes and marinated before cooking in a skillet. Did anyone have problems with the carrots not being fully cooked? I was thinking of cooking them a little before sautéing them. I put the carrots in first and stir fry them a few minutes before adding the rest of the veggies (and I use a different mix of veggies each time, depends on what’s in the fridge, zucchini, broccoli, cabbage, red pepper, etc.). Also, I don’t add the peas till the very end (with the chicken) because they cook fast. I LOVE this recipe and make it often. Is the “1 cup of rice” in the ingredient list measured before the rice is cooked? or after? I felt like the chicken/rice/vegetable ratio was all wrong. The rice is barely noticeable and there was way too much chicken. I used the teriyaki chicken recipe so it had good flavor but 3 breasts is too many. I also only used half an onion. I was hoping for a better results but everyone ate it so that’s the main thing. I made this a couple years ago and it turned out perfect! Now i try to make it and My rice was all clumpy. Any ideas why that happens? As an Asian-American, I make fried rice pretty much every time we have leftover rice. But that’s the key. Leftover rice = cold rice. If you use cold rice to make fried rice, you usually end up with no clumps and perfectly separated rice kernels. Cheers! Is this a breakfast or a dinner dish, or can it be both? Dinner, although there is a breakfast version linked. Delicious, my family loved it. Looks like a tasty dish! I have been making this for a while now. This is HANDS DOWN, THE BEST Fried Rice i’ve ever had in MY LIFE!! I add one extra egg. I also use cooked cold rice and I use the frozen peas and carrot mix instead of cutting up carrots, lol. I once made it with BACON instead of chicken and OMG, Sooo GOOD!!! It is a big hit here!! Thank you so much for sharing this recipe!!! Just made this (we are chowing down now) and it came out amazing! With so few ingredients, I thought it would be more on the plain side but it certainly packs a flavor punch! Try it! SN: I doubled the recipe to make a big batch – 2c brown rice, 2 cups frozen peas/carrots, 1 onion, 1/2 c tamari and 3 eggs. Wow, this recipe is SO YUM! We make it all the time now, bringing in different ingredients like celery or prawns depending on what’s in the fridge. Amazing leftovers too. Thank you! Hi! Just wanted to say that I’ve been making this recipe for a while now, and absolutely love it~ It is TRULY better than takeout!! Also, today I tried it with quinoa instead of the rice, and it was just as good- could hardly tell the difference. Yum yum! What is the sodium content per serving or per cup. I think I found your blog under a low sodium pin. I have made this recipe multiple times. i come back to this recipe whenever i want to make chicken fried rice. i wont even try another recipe! i usually use rotisserie chicken and about half a bag of frozen peas and carrots. making it tonight and cant wait! thanks again! This was Ah-mazing! Made pretty much exactly like it calls for except subbed fresh carrots for frozen peas & carrots (about 3/4 of a cup) and used onion powder bc my kids hate onions. Even my pickiest eater loved it. Win! Just made this dish accordingly -yummy in the tummy!!! one onion; equal to how much when chopped? Delicious! Only change I made was using a frozen mixed veggie mix – green beans, corn, carrots and peas. My son devoured it! About how much frozen veggies did you use? I’m a new cooker and don’t want to mess up the proportions but I’m making this tonight and frozen is all I have! Best fried rice recipe. I use jasmine rice, seems to be better than plain white rice. Serve with yum-yum sauce..yummy!!! Had this tonight. I just made this tonight and I have to say it’s the best chicken fried rice I have ever eaten!! No takeaway can even compare to ho amazing this is!! I had to omit the egg as my son is allergic to it and I added some frozen corn cause I do love that in fried rice. So awesome. Thanks for the recipe, it will be saved and used on the weekly I’m sure! I, too, am a diabetic and need the nutritional information for this dish. we love this!! but since i am diabetic, i would like to know the serving size, calories, and carbohydrates please. Left over rice is best. A lot of recipes will have you make the rice ahead of time and cool it in the refrigerator before cooking. Wow! I made it. They Loved it. It’s a winner! Used left over slow cooked pulled pork. We’ll be making this again! Thanks! Great recipe but three pieces of chicken breast ruins the balance. I used three and it was too much. The rice should be the dominant element in this dish. Otherwise a great recipe. Thanks. What size slow cooker is this for? What kind of skillet would one use to make this dish?, I have tried to make fried rice in an iron skillet and the rice became sticky and over cooked. I use either a wok that I have or a large deep Teflon skillet. Left over rice is ALWAYS the best for any fried rice recipe. Just made this and the whole family loved it! Any preference on what type of rice to be used? I like white jasmine, but we also use brown rice a lot. I have made this several times and we always love it. My question is at what point do I add the sesame seeds? or they just a garnish? Awesome! Better than take-out. Highly recommend. Do you cook the chicken breast first? The recipe doesn’t say! Can’t wait to try it! Absolutely wonderful dish. Simple yet effective. Far better than any take away. Thank you. It’s better to use left over rice that’s been in the fridge for a night.Then fry it is you would usually. Then it’ll turn out better than take-out. Is this a meal that could be fully cooked then frozen? We love fried rice. My son is a fanatic – unfortunately, he thought this was bland. It really does need something – any thoughts? Overall, my husabnd and I thought it was pretty good but not sure I’d make this particular recipe again. You could try adding pineapple. I doubled this recipe today. Used brown rice and threw in about four cups of diced eight ball squash (very mild) and a cup of broccoli florets from our garden. It wasn’t exactly restaurant style fried rice, but it was so good we ate ourselves silly. This recipe is a keeper. Thank you! Well , it was ok, I add one more cup of rice with more vegé etc…but i find a little aftertaste of the sesame oïl that i kept at 2 tbs. I find the rice that we eat at the best chinese restaurant in Cokhrane is more…..fried , With regular rice, i am afraid that if i cooked it to long when everyting is mixed, it will become mushy.Next time i will try to fry it somehow…. This is the best fried rice recipe that I have ever found! It is super easy and tasty! My family loved it and they’re very choosy about their Chinese food! I would like to make this recipe however, it looks like you used white rice in the photos, however the recipe calls for brown rice. Which one is best to use? I saw two others have asked similar question but have not received a response. Can anyone answer this who has made the dish?! It is just personal preference! Ii used white rice, and it was awesome! I assume you could use brown rice as well, though. Recipe states brown rice but the pictures show WHITE rice….. what gives? The recipe calls for brown rice, but that sure looks like white rice i the pictures. Also you say to only cook the rice for 10-12 minutes, and my feeling is that brown rice would still be hard as a rock after only 10-12 minutes on the boil. Am I missing something here? This was pretty good, although the soy sauce flavor (I used the teriyaki chicken that was suggested) was super strong at the end (I would maybe suggest adding soy sauce to taste rather than the full 1/4 cup at the end). I ended up cooking up another batch of rice at the end to mix in with it to dilute the strongness. Although it didn’t taste quite like take-out fried rice, the end result was filling and my husband definitely enjoyed it. This was really good!! I decided to add soy sauce to taste at the end and cooked my chicken with some extra minced garlic and soy sauce. Hubby said it was better than our favorite sushi house! great recipe. Everyone in my family ate it, which is close to a miracle. Let me just say trying to make dinner for my nieces and nephew is like trying for world peace. They are very picky and quick to opt not to eat. I tried your recipe tonight and got not one rejection. Amazinflg, thank you for a great and seamless recipe! great recipe even the littles ate it Thanks! HI! Love this and every recipe that I’ve tried of yours! One question though– what do you consider a serving size?? When I made this I measured a 1-cup serving and know I got WAY more than 3-4 servings, probably closer to 7-10 servings. Just wondering since I track my calories and trying to figure out how much I’m getting from this one. Thanks! This was very good and easy.Better t h an takeout. U put in raw ur cooked chicken? She says in the recipe used COOKED chicken. So…cook it until it’s done. This is an amazing recipe, thank you. This is a regular dish in our house now. Fantastic site! Looking forward to trying more recipes. I had some chicken marinating in teriyaki and I really wanted some fried rice. Probably the simplest but most successful recipe I have used. I did just toss a few things together. I used canned peas and carrots, garlic powder instead of fresh, and I added in dried scallions. But other than that, it was so wonderful! Was afraid of the sesame oil, but it really adds a nice subtle nutty flavor to it. Tasted just like a take out pace. 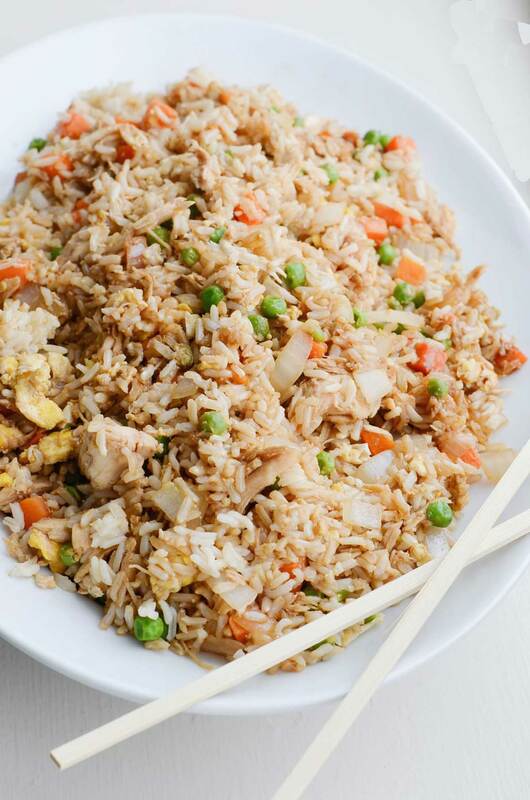 This is the best chicken fried rice recipe I’ve found! Thank you it was fantastic. This looks exactly as our Peruvian recipes. My mother used to cook this dish since I was a kid. i was wondering how long do you cook the chicken in the slow cooker? and do you cook it on high or low? It states to cook on high for 2 hours. It says to cook in slow cooker for two hours on high. I am happy to find you and your rich website. I made the recipe yesterday for dinner for my daughter and my mum. They loved it. I add some fresh ginger (a teaspoon). It was perfect. Thank you Rachel. No need for a takeout now Lol. Okay, so this is “thread necromancy,” but … I tried this last night — wow! First time I’ve ever made fried rice and it hasn’t been a disaster. Turns out I’ve been over-frying the rice all this time. Last night’s batch was delicious. Thanks very much for this quick and easy recipe. I suspect it’s going to be come something of a staple around here! It was a big hit at my house. Thanks for sharing. Omg! I love this recipe, it’s amazing and so simple. Thanks for sharing! My whole family loved it, thanks again. Does it matter what kind of rice you use? Would boil-in-a-bag rice taste as good? Thanks! We add a cup of unsalted peanuts to this recipe. This recipe is fantastic and easy to make, but the peanuts take it up a notch and make it more filling. This recipe never fails. Added dried oregano, ginger,coconut amino instead of soy sauce, a pinch of cayenne pepper. Great recipe, I. Add green onions and fresh bean sprouts also! This was a very good dish, we really enjoyed it! I will certainly be making it again! Just finished eating a huge plate of this, I did pork fried rice tho and added mushrooms to my veggies and it was amazing, also added some yum-yum sauce to it and I felt like I was eating a dinner at a Japanese steakhouse! Thank you for the recipe and the simplicity it had! Definitely will keep this for my future meals! We LOVE this recipe! My very picky teenage daughter inhales this so I rely on this recipe to get protein into her – a double whammy of chicken and fried egg. The only thing I change is to add a tablespoon of minced ginger with the other veggies. I use whatever left-over chicken or pork I have on hand. Thank you for this keeper! This recipe is definitely a keeper for my slowly growing gluten free menu ideas! I used ground chicken because that’s what I had readily available. My mom isn’t a fan of ground chicken but eating it tucked into this recipe even had her happy! Thanks! Love your picture of you eating food…First time I have ever responded to any posts, pinterest or otherwise….could be the vino I had this evening contributed to my comment but you seem so real and it is very appreciated! Will check your site out lots more…planning on making Chinese food tomorrow as it is the Chinese new year happy new year to you. Will see what I come up with menu wise! Hi, Question Did You Cook The Chicken First seperate ? Thank you Marilyn! That is amazing selflessness. Marilyn I hope things get better for you! I’m praying for you guys! This was exactly the fried rice I was hungry for! I’ve tried other recipes that had you cook the eggs separately and cut in strips, but wasn’t crazy about it. Tried another where you poured the eggs over the rice and meat and all, but it looked really unappetizing. Adding the egg this way was perfect! Big hit with the whole family! This is amazing and so easy! This was fantastic!!! My family went on and on about it. Definitely will be a part of regular rotation. Thanks so much!! Found this on Pinterest a months ago, just made with leftover shredded cabbage then added mushroom, and beef instead of chicken was wonderful!! Thank so much for a great for a great dinner recipe! Made this tonight and it was very good! I will definitely make again! This recipe is truly delicious!! I made the chicken teriyaki in the morning on the stove and let it marinate all day in the sauce! The chicken shredded perfectly! Had no sesame oil, used vegetable oil instead and it was fine!! My son loves chicken fried rice and I’ll make this any day rather than ordering take-out!!! Loved it!! Excited to make this dish tonight! Made the chicken via your recipe, and my house smells amazing! Cant wait to add it in with the stir fry and see how it tastes. I also follow Desiring God, Matt Walsh and a few of the other blogs you listed. Getting a feel for your taste, i thought I might suggest The Nester,, its a beautiful blog on home, perspective, imperfection and a little bit of everything in between. Anyway, thanks for inspiring dinner tonight! Loved this recipe. I make it often. Made it tonight and whole family plunged in to eat. add an extra 1/4 cup of soy sauce? I did, it came out a little sweeter because of the teriyaki sauce, but still excellent. Love, love, love. I swap out the chicken for pork sometimes, or shrimp. Same basics just different protein. Nothing changes other than that. I make extra so I have a late nite snack while watching TV. Delish. Could I use Sunflower Oil for this recipe???? I can’t wait to try this! It sounds really good! I made this last night and loved it. The only thing I changed was leave out the peas (yuck) and insted of soy sauce I added some of the broth from the teriyaki chicken. Totally delicious. Thanks for a great recipe. Excellent recipe! So quick, delicious, and cheap! Followed your reco to use your slow cooker teriyaki chicken recipe and kept the other half of the chicken for quesadillas tomrrow. Thank you! This is one of our favorite weekly staples now! We found it via Pinterest and, now, whenever we have leftover rice, we get excited knowing we can make this. :) We often throw in frozen shrimp instead of cooking chicken, so it can take literally 15 minutes from start to finish. My daughter and I made the chicken fried rice. It was so easy especially with the step by step and the pictures to go along with each step. Delicious! I made this for supper tonight, I LOVED it. Thanks for sharing! I didn’t use the teriyaki chicken, no time, but just plain sliced up chicken breast. This will be a regular meal in my home. Next time I will make the rice a day before and let it sit in the fridge as someone else had suggested. Thanks again! This is great and Rachel was right it’s so much better than take out, besides, you never know how long stuff has been sitting out at restaurants. My goodness – thank you for this recipe! My boyfriend is THE world’s pickiest eater. He requests this all time and told me “This is the best thing you’ve ever made” after the initial attempt. I made it with your recommended teriyaki chicken recipe. The duo is too good to switch up! People – you must make it with Rachel’s teriyaki chicken recipe. It is so very simple and smells amazing in the crockpot. Of course, even better is that it tastes amazing! Great recipe! Just a few pointers, for the most authentic restaurant style fried rice use jasmine, but also cook the rice a day ahead and refrigerate. Keeps the rice firm and not mushy, and for gluten free use tamari soy sauce instead of regular. This was really good, and very easy. I added mushrooms and bean sprouts and it was delicious. Will be a staple at our house. For those of you concerned about the sodium level of soy sauce, try Bragg’s Liquid Aminos. Tastes and looks like soy sauce, but has a fraction of the sodium. One of the best recipes I’ve ever found. I rarely leave comments about any topic online except when something is that good, or that bad. This recipe is deserving of a comment because it is that good. I have been searching for a good fried rice recipe that will not only please my family, but me as well. Ever since I made this for the first time a couple months ago, I get requests for this for dinner. That never happens here. This recipe is easy to prepare and doesn’t have 20-30 ingredients like some other recipes like other recipes. Thank you for publishing it. Do you use instant rice or sticky rice? I don’t know what I’m doing wrong but mine never comes out as good as take out. So I thought maybe it’s because I’m using instant rice. Any pointers you could give me would be great. So, I make this every now and then, enough to be considered often. My family loves it! If I mention this recipe in front of my brothers children they refuse to let me leave their house until I make it. I’ve had my keys, car, and cellphone hidden until I made it. I made it out alive today after mentioning it by promising to go back tomorrow and cook dinner for them. I’m excited to do it though. They have an exchange student from Spain who is now excited seeing the others become crazed over just the thought. So your recipe will reach Spain!!! Thank you. It is unbelievably delicious. Or as our family describes it as SCRUMPTRULECENT!! Really yummy. I can see making this for my kids and their friends when they get a little older. I wasn’t a super fan of the sesame oil though. I wonder if you could just use something like vegetable pil in the first step instead? Very good, easier than I thought. Even my picky kids liked it. Soooo good! First time making this and definitely not the last! I have made this so many times following the recipe exactly as it is, and I seriously LOVE it every time!! As in my mouth waters as I am cooking…so.good. This recipe is so DELICIOUS!!! (And super-easy, too!). I wanted to give it 5 stars, but for some reason I am only able to give 3, so I left blank (glitch?). I used minute rice and one breast from a store bought, pre-cooked chicken. I also added an extra 1/2 cup of vegetables, since I was serving this as a one dish meal, and used low sodium soy sauce (since there is so much seasoning in pre-cooked chicken). This is now officially one of my go-to meals for busy school nights. and also very good photography..hats off Rachel. I just made this, Delicious!!!! In Pinterest this shows as gluten free. Most soy sauces have wheat so need to use wheat free soy to be gluten free. Sounds yummy. I really enjoyed your recipe, I added some cooked shrimp,cooked chicken,pork and bean sprouts with scallions..it was Fantastic! I made this last night for dinner! So good! Although my mother is an executive chef, I did learn quite a few things from her, but I still have no business stirring up craziness in the kitchen. Luckily, I can follow recipes! I simmered the chicken in teriyaki sauce, but I’m going to try your recommendation next time. I added an extra egg since that’s one of my fave parts about fried rice. Also, I forgot white onion. So, I added 2 chopped green onions at the end, and it worked out! :) My picky eating boyfriend went back for seconds! This was so amazing!! I paired it with your teriyaki chicken recipe (also, amazing!! ), added an extra egg (just because I like egg in my fried rice), and made some yum yum dipping sauce. I know I’ve made some good when my fiancé with scrap his bowl/plate to get every last drop. I made this a couple nights ago and it was fabulous.. making it again tonight. I just added my own little touch to it.. instead of sesame oil I used butter to cook my chicken and my stir fry my vegetables in.. and also I found a really good honey teriyaki marinade for the chicken to put on it after I cooked the chicken.. it was fabulous.. brought the left overs into work for the girls to try and they loved it too! Does anyone know the WW points for this? I only have extra virgin olive oil.. Would that work?! I want to make this for dinner tonight! One shouldn’t generally use sesame oil as a deep frying oil. It has a low smoking point and tends to “burn” before your meal cooks through. Sesame Oil should be used in either a marinade or drizzled over your servings. I would suggest using peanut oil as the cooking oil here, and top with sesame oil after it has cooked. Just my two-cents, I’m acres away from being any form of a chef! Sorry, meant stir-frying oil, not deep frying. :P But it still holds true! Awesome recipe; it was quick and easy and passed the kid approval! I made it with rice noodles instead of rice and it was fantastic! This was delicious. I’ve made it twice since finding the recipe on Pinterest. Once I made it with regular white rice and the second time I used Jasmine rice, which made it taste like the Thai restaurants. Really simple to make and adaptable to whatever you have on hand. Do you use a specific kind of rice? I never know what kind when making these kinds of things. Thanks! We always use Jasmine rice for this dish but I don’t see why you couldn’t use another one. Someone further down said they used brown rice. Made this tonight to serve with honey sesame chicken and it was delish. I made it without the chicken since it was a side. I didn’t have carrots so I used all peas, and made the rice with chicken broth as suggested by someone else, but otherwise I made it exactly as written. It was very good despite the fact that I burned the rice. I am just not capable of making rice without causing a problem. I will definitely be making this again and would love to do it with shrimp! Hi! This recipe is perfect and makes an amazing fried rice. The only suggestion you should try is when you cook the rice, use chicken or vegetable broth instead of water to boil it. It will taste EXACTLY like take out but hot and fresh and amazing. Oh maaannnn! I just made your better than take out chicken fried rice and it is unbelievably yummy!! I am telling everyone who will listen! I substituted brown rice for white rice and used grapeseed oil in place of sesame oil because I didn’t have sesame oil and grapeseed oil burns off at a high heat and doesn’t have a strong flavor. I used garlic powder in place of garlic, but garlic would have definitely been preferable. It came out pretty tasty, but was a little wet, probably because of the frozen vegetables. Next time I will cook off the water or drain them. It was only wet compared to take-out. It was not too wet to eat or really that most noticeable at all. Anyway, this recipe is pretty good and I’ll make it again. This was super easy to make and absolutely delicious!! I used left over stirfry chicken, threw in some mushrooms and canned veggies and it was light, fluffy and full of flavour!! Even my 13 year old daughter was impressed. A new family favourite! Just FYI msg occurs naturally in soy sauce. Hey Rachel! Your pictures are to die for! What recipe plugin do you use? I love how clean it looks. It is called easy recipe. Your Better-Than-Takeout-Chicken Fried Rice recipe was good. I tweaked it a bit by using all the peas and carrots-16 oz bag and only two cups of rice cooked in a steamer. Any more rice would not have fit into the pan. The chicken was marinated in soy sauce for several hours and cooked in sesame oil, cooled then chopped. We found that double the amount of soy sauce was needed for our taste. Thanks for sharing, my husband and grandson loved it and went back for seconds-very economical too! Looking forward to trying one of your other recipes. This recipe has changed our life. We eat a lot of chicken. This is really great for the left over cooked chicken. I say “leftover” in the most positive wonderful way. And, an extra advantage is rice is cheap as are eggs. It’s all good. Delicious! My whole family liked it and it smelled wonderful! Definitely a keeper!! Excellent recipe! The kids and adults liked it. A winner. This was good! I made a double batch for plenty of leftovers! Yum!!! I did the same. Curious to see how the leftovers hold up….if tere ARE leftovers. YUM!!!!!! Found another easy meal to put in the rotation!!! Oh just one more comment that I had not read before cooking my rice. 3 cups of COOKED rice. I missed that and prepared 3 cups uncooked which was too much. This was a great receipe. You can toss any veggies in here. More or less soy depending on how salty you want it to be. I had just enough for lunch left over the next day and it was just as good. Thanks for sharing this fantastic do again meal! This has become my go-to recipe when I need a quick meal. Much better than take-out!!! Thanks for a great recipe! I made this recipe yesterday with a bunch of vegetables that I didn’t want to go to waste. It was by far the best fried rice I had ever had. I didn’t even add chicken. this recipe is definitely going in the rotation. I just want to thank you for posting this recipe. I’ve already shared it with three of my good friends. This was great! I didn’t have sesame oil so I substituted coconut oil, also awesome. Thanks for the great recipe! Nice to make something like this and know what you are eating. I think next time I may even add an extra egg. I found this on Pinterest and made it for dinner tonight. OMG it was excellent. We have been trying to stay out of restaurants to save money, and my husband asked while eating this, “Oh my God, are you going to become some type of master chef who knows how to cook everything via eating at home?” He loved it, and so did I. Thanks so much for such a great recipe! This is a great way to use up veggies that you need to use before they go bad. I added celery and green onions and made it with whole grain rice. Delish! I’ve tried several fried rice recipes, and they’ve never turned out well. I made this recipe a few nights ago. My husband took a few bites and asked, “How did you make this? Is it from scratch? It’s awesome!” So this is in the official meal rotation now. He’s vegetarian, so I skipped the chicken and doubled the eggs. I also used brown rice. Thanks for the great recipe! I tried this for the first time tonight. My rice had a “wet” texture to it. I fixed it per the directions on the bag, but I rarely fix rice so not sure what causes it to turn out this way. I tried cooking it out but it didn’t help. Do you know what causes this and how to correct it? Thanks for sharing the recipe! I don’t know if there’s a way to fix it when you prepare the rice that day, but I always prepare rice a day ahead of time or use leftover rice. It definitely helps the rice not end up with a wet texture. Very good and healthy…I used stir fried shrimp to put on top before serving…don’t over cook the vegtables and rice. I made this with tonight using Uncle Ben’s original Ready Rice. I much prefer Chinese takeout restaurant rice but this was better than stovetop rice. I LOVE this recipe! I cut back on the soy sauce also and use toasted Sesame oil. Made this for dinner tonight with my roommate and we both loved it! I added the soy sauce after removing from heat – a tip I learned from my Vietnamese mom :-) However I also thought it was slightly too salty so will add less soy sauce next time. Thanks for the recipe! I have now made this twice and my family loves it. The second time I used your teriyaki chicken recipe along with this and it really ramps up the flavor. Fantastic! Thanks for your recipes. Made this…yum! Thanks for sharing! Hey there, Love your recipe, found it on Pinterest. Curious about your pan that you’re using. I hate the wok we have, looking for other un-non-stick options. Thanks! I used my All Clad stainless steel pan and it turned out great, didn’t really stick, just a small bit of scrubbing. Made this tonight and we three really enjoyed it! We added stir fry chicken and veges on top … Delicious! Just made this recipe tonight! Came out wonderful! I didn’t use any oil (just water) in the cooking and I used brown rice instead. Also a note to those who try this: Use a big pot. This will fill a frying pan up to the TOP! What kind of rice is used in this recipe? I don’t know if this has been said, but 3 cups cooked rice is 3 cups AFTER it’s been cooked. Ended up doubling everything, because I used 3 cups rice PRE-cooked. Was still really really good, and would definitely recommend. Could I use Canola Oil instead of sesame oil? Sesame oil is not something we keep around and in our family of seven I try to keep the grocery list to essentials. It won’t be quite the same, but could definitely work. What a fun, big family! Try adding a tablespoon of a crushed chicken bouillon cube when sautéing the vegs. (this deepens the flavor of the dish), save one tablespoon of the sesame oil to drizzle over the rice when its done this perfumes the rice and gives that Asian aroma; also I would suggest finely slicing some green onions and sprinkling it over top at the end. this was GOOD!!! we ADDED SHRIMP!!! it was good. We eat it 3 times a day!!! YUMMMY Yummy in meh tummayyyy!!! we have two on the go as I’m writing this! This Recipe is AWSOME!!! We eat it at least once a week!!! We have added shrimp on occasion and even imitation crab meat. It does not matter what you add it is just delicious! YUMMM Got a batch cooking now! If you use crab instead of chicken, try adding some crispy bacon pieces and cilantro, finished with a squeeze of lemon. I’ve made this a few times now and if I have leftover chicken on hand it’s super quick and simple. The one time I made the slow cooker teriyaki chicken recommended and it was fantastic. Since then I’ve just stirred some teriyaki sauce into my leftover regular chicken and that’s been good too. It might just be my sesame oil but I found it too overpowering, so now I use half sesame and half grapeseed oil. This was a great recipe with brown rice. I added chili garlic sauce to add a bit of spice. It was great! My daughter made this and it is delicious! Do you use regular sesame oil or toasted sesame oil? Recipe look awesome! 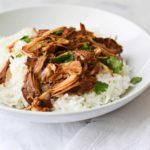 LOVE this recipe and love the slow cooker teriyaki chicken with it. This is the new favorite in our house – thanks for sharing! I’m making this tonight for dinner! It looks so delicious. Thank you for a great, easy recipe for fried rice. I haven’t seen anyone else ask, but do you season the chicken also? Fantastic recipe! Kids LOVED it! I think the sesame oil makes all the difference. Thanks for sharing!! My boyfriend and I love cooking at home and experimenting with recipes. We tried this recipe (minus the frozen vegetables simply because we had none) a few weeks ago and I have been obsessed with it since! This was truely better than takeout! It was so much more leaner and surprisingly did not taste bland or terrible which was the results I was expecting since I never made before. We seasoned the chicken before panfrying it and I added 2 very thinly sliced limes into the rice. What a difference it made! The recipe and instructions were so simple. Thank you for putting this up! I’m in the middle to cooking this again now! I’m not sure if I’ve ever had chicken fried rice, but after making this I crave it everyday. It is SO delicious. My kids even liked it, which says a lot. Next time I’ll add red & yellow pepper slivers but so good just as it is. It will be a forever staple. Fabulous! I’ve used chicken thighs and pork. I usually add another egg, as well. My family LOVES this. It is the ultimate way to clean out the fridge…and no complaints about leftovers! If you want to kick it up a notch, cook bacon and use the oil to fry the rice and toss in Bacon. I make something similar all the time. I usually use cold brown rice, and I like to put it in the pan first so it gets a little toasted. I’ve made it with and without chicken and also with pork chops. This is a great use for leftovers! I am not, by any stretch, a cook. I love to bake and I can follow a recipe pretty well, I just don’t enjoy cooking. I’m always looking for an easy recipe that I can make. My husband loves to cook and we agreed when we married 25 years ago, that he would cook and I would clean up. I made this for dinner tonight and it was actually pretty tasty. I think I surprised my husband and daughter. We’ll see what my son, the chef, has to say about it. I put the ingredients into a calorie counter and came up with the following nutrition information, based on your comment that this recipe serves 6. (While scrolling back through comments, I saw a comment asking for this information and I use My Fitness Pal, so I needed it as well). It’s actually pretty healthy too. Thanks so much, Rachel. I just made this for dinner tonight and this recipe will definitely be added to our meal rotation. It was so quick and easy! I used chicken broth in my rice and added about a tablespoon of hoisin sauce to ours. It was delicious! Just made this for the third time. It’s so ridiculously easy and soo tasty! My husband had thirds! Even my mom, the fried rice queen, loves it. Never buying takeout again. This is so yummy! And it is nice to know all the ingredients that are in my Chinese food :) Great recipe, this one is going in my vault! Would this be good with brown rice? Yes, I make it like that often. Yummy….so easy and so good!! I absolutely loved this recipe. My boyfriend and I ate every morsel! (mostly him) I was so proud. I will definitely be making this again! This was my first time using sesame oil… I loved the flavor, it definitely gives the Asian flare. This dish was simple to prepare, and very delicious. Thanks! The first time making rice, used Basmati, it turned out ok for not using minute rice. The next day made fried rice using this recipe, best fried rice I ever ate! thank you. Well I’ve attempted fried rice recipes a few times to no avail but when I read this one I was like seems legit. And it is. Love this. 3rd time making it. Thanks! Is Toasted Sesame Oil the same as Sesame Oil? 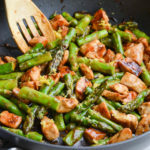 I read somewhere that Sesame Oil is for flavoring not for cooking and can burn, so I just wanted to check what the best type of oil is to use in this recipe? I would also like to know more about the sesame oil – exactly what kind is best to use? Just made this for like the 100th time. I love this recipe. Tonight my rice had bugs in it :( ew never had that happen, but since I already had all the veggies ready I just used quinoa instead. It turned out excellent. Tried this last night. The family could’ve believe this was not from our favorite Chinese restaurant. It honestly, it IS better than take-out, AND better (more authentic) than any other fried rice I’ve cooked at home. Everything turned out great thanks! Very Yummy!! My son who is a chicken fried rice aficionado loved it! Very easy to make..threw in some baby corn and snow peas! I love the recipies. Where can I buy a book that has them all????? I love this recipe and have used it for a template for pork fried rice. I add more meat because my family likes more meat. I also add more veggies. This is a dinner the whole family enjoys and is great to take for lunch the next day! Loved and EASY! Used leftover chicken and pork from the grill. Fresh carrots and green & white onions. No peas! Yummy! Oh my goodness…… This is delicious. Thank you. This is simply delicious. My son who is a picky eater loves this dish. Thanks so much for sharing! It will be my go to meal we will have once a month for sure. Came back to make again tonight!! Wow!! This was absolutely delicious. It will become a staple in my house. I used Old Cape Code Teriyaki to marinade the chicken. It’s the best teriyaki marinade out there. This recipe is my new favorite meal! Thanks!! Made this for my family for dinner tonight using the teryaki chicken recipe and it was DEEEELICIOUS!!! I’m always on the lookout for new recipe ideas that I can surprise my family with and this definitely blew them away. I was told it was better than the stuff you get for takeout! It made a lot so i will be having it as leftovers tomorrow as well! Cant wait to try some of your other recipes! everything sounds soo tasty! This was awesome. Back to make it again today. I made this last night for a house full of 4 boys and my boyfriend’s mother. They all loved it!! It was super easy to make and it came out great. I used the slow cooker teriyaki chicken with this and it was delicious. I will definitely be trying some of your other recipes. Thanks! I would recommend that people begin with 1/8th cup soy sauce and add more as needed. I added in the 1/4th cup all at once and found the soy sauce overpowered all the other flavors. However, I appreciated the ease of this recipe and will make it again with less soy sauce. I LOVE THIS RECIPIE!! IT TASTES JUST LIKE FRIED RICE YOU WOULD GET AT A RESTAURANT!! This is amazing! I’m from New York, and I always hear people say that you can’t beat the Chinese food here, but this is pretty close if not just as good as takeout. It tastes great, plus I love that it’s healthier. I made it without chicken because I’m a vegetarian, but I did put in some extra peas and carrots. I added a little less soy sauce because I don’t like a strong taste of it, and it was perfect! Awesome recipe! how can I get on your ‘mailing’list? All your food looks amazing! i want to go cook some up right now! I have my family of 25+ over every Sunday for dinnner and it’s fun to have new things to try! Thanks Laura! There’s a place to enter your email in the right sidebar. I’ve found that cooling the rice in the refrigerator avoids mushy rice. Then you don’t have to heat up your oven. Made this tonight with the slower cooker Terikayi chicken and it was soo good! Thanks for sharing the recipe! This was my second night in a row of trying your tasty recipes. My husband and I LOVE this recipe. I did the slow cooker teriyaki recipe for the chicken and everything was absolutely delicious! Didn’t feel like cooking tonight but pushed myself to cook this and I am SO glad I did! Delicious, easy and so quick to prepare! I just made this but instead of the chicken teriyaki, I sauteed chicken breast pieces in soy sauce, oil, and a little bit of cornstarch. It came out amazing. This was delicious! I made it with your slow cooker teriyaki recipe. I will definitely be making it again. Thanks for sharing recipe! I made it with brown rice. Do you need to use sesame oil or would canola or olive oil work just as well? This is so good, I have made it so many times . Thank you for the recipe. It would be good with brown rice too! Sesame oil is not a cooking oil. It will burn at cooking temps. Its mainly used for seasoning. What would the calorie intake be on 1 serving of this? Made this tonight! OMG it was sooooo good! My hubby is a picky eater and doesnt usually like chinese food but even he liked it! I made the slow cooker chicken teriyaki and added it the the BTT fried rice! I did as a few others suggested and scrambled the eggs separately and added them before I added the chicken, rice and soy sauce! I used olive oil because I didn’t have sesame oil. I added a tsp. of ginger for more flavor! I also made the rice and put it in the oven on a low heat to dry it to prevent “mushy” rice. That tip worked great! Do you have to put eggs in there? You don’t HAVE to, but it would change the consistency. Still yummy, however! Do you have to use. Sesame oil? Super easy and even more delicious. Tasted a lot like PF Chang’s fried rice. And did I mention how easy it was? I believe the sesame oil is the secret ingredient, I don’t think I would substitute any other oil. Made this tonight with the teriyaki chicken as suggested…yummy! I also threw in some water chestnuts. 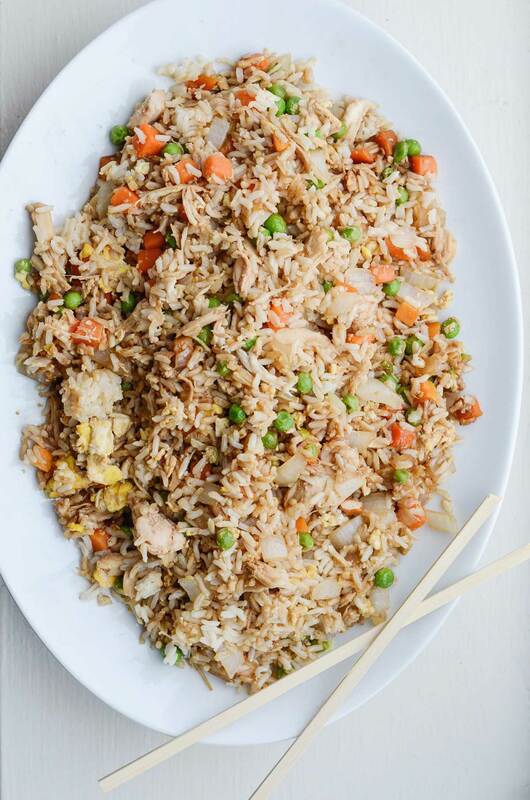 Just found your website on Mr. Food and have printed out your recipe for Better-Than-Takeout Chicken Fried Rice. Loved the presentation, ingredients that I have on hand and the ease of preperation. I did not read any reviews as I don’t like to be bias in any way. Will be making this soon. I will make this as written(don’t like to change anyone’s recipe until I have tried it) and then I will give you an honest review. But, as I have read through the recipe and saw your photo’s, I’m pretty sure that hubby and I will love it. You wouldn’t happen to have a recipe for General Taos Chicken would you? Thanks. Thanks for the suggestion. I will look into that. Hope you enjoy the fried rice! I found this on Pinterest – excellent recipe and so quick to prepare! Thanks so much for sharing! Could you cook this up and then cool and freeze it? If so, I’m guessing it would work to just thaw and then heat up in a skillet til warm? I have made this recipe numerous times and have frozen it. I just reheat in the microwave and it tastes just as good! Also tastes amazing the next day. Yes, the green and gray button at the bottom of the post. Had this for my dinner this eve, nom nom! Thank you for sharing! We have this atleast once a week in my household. Absolutely delicious! Thanks SOOO much for sharing the recipe! Super easy and super delicious!! Thanks for sharing! Tried this last night with the Teriyaki chicken and it was delicious!! Made this tonight very easy to make. I added Chinese 5 spice to give it more flavor. So yummy. Super dish! Fast, easy & delicious! I like adding a little bit of fish sauce and black soy sauce, garlic powder, and some pepper if you want a more flavorful taste. How can I print a short version of this recipe? The green and gray button at the bottom of the post before the comments. I forgot to state that instead of chicken I used shrimp, I just cooked the shrimp with a little EVOO, salt, pepper and red pepper flakes. I just made this for dinner, it is fabulous. We’ve been craving chinese food and we have no restaurants here in Wiesbaden, Germany. It was better than what we have back home. Thanks for sharing!! This was so easy! I always pick out the peas and carrots so I used green bell pepper instead, and it worked perfectly. I didn’t have time for slow cooker chicken, so I just cubed chicken breast and cooked it on the stove with teriyaki sauce. This makes a ton of food! has anyone made this without making the teriyaki chicken and just using shredded cooked chicken instead? Lisa I made it with just chopped cooked chicken and it was really nice. What is the font on better than take out? Thanks! It’s called Amatic Smalls. Love this recipe!! It’s such a huge hit with my family! It’s super delicious, easy, and quick to make! I couldn’t imagine this recipe without the yummy teriyaki chicken! Made this last night and it was so awesome! Much better than takeout and it was super easy. Thanks for sharing!! Tried this tonight and loved it!!! Thank you! Can you substitute vegetable or canola oil for the sesame oil? I’m planning on trying this tonight and that’s all I have lying around! Thanks! I used canola oil and it was amazing. So good!!! Used grilled teriyaki pork tenderloin instead of chicken. I made this for dinner tonight with fresh peas and fresh carrots and it was a HUGE hit! Yummy! This is the way I’ve made my fried rice for 50 years.Learned from another Marine Corps wife . It was a staple dish among Marine Corps families. The only difference is I added the meat in with the veggies and onions. Oh yes, and I used bacon grease from the bacon I added to the fried rice. Yours sounds much healthier. This sounds marvelous, and so easy to prepare! I suppose that it can also be made with cooked pork. I’m definately going to save this recipe. Instead of frozen peas and carrots could I use canned? I’m gonna try this tonight! I found a recipe similar to this somewhere else and they said that you can fry the chicken instead of using cooked chicken, so I’ll see how this works! Made this tonight and it was wonderful and super easy!! Made for my mother who doesn’t like Chinese food much but she loved this. Thanks so much for sharing, very much appreciated! Hi from England! I tried this recipe tonight along with the slow cooker teriyaki chicken and it’s delicious. My eldest daughter, who is a fussy eater, ate a whole bowl of it and asked for seconds – praise indeed! Thanks for sharing the recipe. I made this for supper tonight and can’t believe how good it was with such simple ingredients! Definitely the best fried rice I’ve had. Thanks for sharing the recipe:)! I made this tonight along with your Slow Cooker Teriyaki Chicken and we LOVED IT!! I used brown rice and made it ahead like some others suggested. No leftovers :( . Thank you so much for sharing this…..no more takeout for us! Made this for my family tonight. They loved. My 4 year old son loves fried rice and he thought this was fantastic or in his words “delish” thank you for such a easy great recipe. Made this today with brown rice and it was delicious, best fried rice I’ve ever eaten! I was wondering if this would be safe to freeze and reheat later? Yes, that would be safe! The important thing with rice is how long it’s sat there warm. The problem with rice is a certain toxin, which loves ‘warm’ rather than hot or cold. Cool rice down quickly, reheat quickly, and it’s perfectly fine – it’s letting it sit in a bowl and cool down slowly (so it sits there ‘warm’ for a while) that causes problems. Whenever I cook rice, I spread it out onto a cool baking tray or two to a thin layer and put in the coolest part of the kitchen (or the fridge) so it cools quickly, then it’s quickly transferred to the freezer. I reheat by microwaving straight from frozen to piping hot. Excellent recipe! I used rice that I cooled in the fridge a few hours; carrots, green and yellow peppers (didn’t have peas). Turned out great! Wonderful recipe – thanks for sharing. This is pretty close to my go-to recipe with one exception and I humbly make one suggestion with a promise that you will notice a huge difference.. Cook your rice ahead of time and put it in the refrigerator for a few hours or even overnight. A sweet Asian lady shared this tip with me. The cold rice can be manipulated easier without causing that “mushy” effect. Try it. It’s the secret of most Chinese restaurants. do you think this recipe would work with quinoa instead of rice? Absolutely! It’d have a different texture and flavor, but still yummy, I bet. I made this with 3 parts rice to 1 part quinoa and it was great. If you have a rice cooker just substitute some of the rice for quinoa and cook as normal. thanks for the recipe. Delicious! I added green and yellow pepper, zucchini, and snap peas, all diced small. Math this the other day. Very yummy. It would be rally nice if you posted a recipcorded or posted the directions w/o a tonphotos in between it so the recioe will be easier to follow when cooking it. I recommend using the printer friendly view. Made this for my family today. And everyone raved about it. And your right, it is way better than take out. And your perfect directions made it very easy. Thank you. I’ve been using a lot of your recipes the past few months, including this one. Thanks! My hubby made this for us tonight. He followed your recipe, and it was DELICIOUS! Thank you for sharing! fried rice is made best with day old rice…. Japanese secret! Great recipe…yum! Could not believe how easy this recipe was. To think of all the bad fried rice I’ve eaten. This is definitely going to make it into the regular rotation at our house. The ingredients are not exotic and the timing was fast too. Thanks for adding to our bag of tricks! I am going to make this with brown rice and leftover Asian style pork….can’t wait to try it. Thank you! Such a great recipe! We started making this almost weekly at our house! We LOVE it! Thanks for sharing! Made it with leftover rotisserie chicken and it was still good. I bet this would be delicious if you added pineapple too! Just made this tonight. I served it with a fabulous Hawaiian teriyaki chicken recipe I found, and used the chicken from that recipe in the rice as well. It was delicious! I forgott to make my rice ahead of time, so it was a little mushy- but that’s my fault! Best fried rice I’ve ever had otherwise! Did you use light or dark sesame oil? Dark is pungent and has a low smoke point. do you happen to know the calorie count for this? It’s better if you use day old rice. Just make the rice a day before, or even, a couple hours before and put it in the fridge to dry it out. If you cook it then immediately put it in the stir fry it tends to be a little mushy. That’s how I made my stir fry in Hong Kong! Noted Thank You !! I am going to do the rice always the day before now NO MORE MUSH Yes !! This was so incredibly good, and easy to make to boot! I used a 12oz. package of market brand prepared chicken breast. This recipe was awesome! I eat fried rice more than I’d like to admit. The recipe tastes great, and saves me money. Win – win! does it have to be sesame oil or can you use just regular vegetable/canola? Other types of oil work too. The flavor of the sesame oil will add additional flavor to the fried rice that vegetable oil or canola oil will not. If you have sesame seeds, you can grind them – maybe around a tablespoon – into a paste with mortar and pestle and add them to the stir fry towards the end to add a bit of nutty flavor. A Chinese friend says he never orders fried rice in a restaurant – he says fried rice is just leftovers. But that gives you an idea of how flexible a fried recipe can be. Once you’ve got the basics down from this tasty-looking recipe – add more vegetables, use an oil of your choosing, change out the meat – just mix it up! just made this for dinner and it came out great!! i am a terrible cook and appreciated the easy directions. thanks for posting! I would love to print this out and make it but I’d have to have a lot of ink for unnecessary pictures. Too bad their isn’t a printer friendly button to just print the recipe without all the rest. There is a green & gray printer friendly button. They’re located in at the bottom of every post. how many calories are in a serving for this meal? This is nearly the same way I have fixed fried rice for years–only difference is I put the chicken and onion plus our favorite spices(garlic powder,crushed red pepper) in the wok/skillet first. (I also use any vegetable oil such as canola, etc.) I fry it up and then add the rice. Then add the frozen peas and carrots. Add a couple of eggs (break the yolks) and let them cook awhile, stir it all together with the soy sauce. Best recipe, glad someone has posted it! This recipe is excellent!!! I just cooked it tonight (made my chicken and rice last night) and loved it! My daughter didn’t like the onion so I may omit next time and add broccoli but overall perfect recipe!! I made this tonight with the teriyaki chicken…..FANTASTIC! I used some of the leftover liquid from cooking the chicken instead of the soy sauce….delish! Thanks! Another good thing for this is using day old rice…it’s hardened up a bit so doesn’t make it as mushy. I found this recipe on pinterest and I am going to make it tomorrow. I have all the ingredients I need but I can’t seem to find the sesame oil anywhere! Does anyone know what grocery store has sesame oil? Or if I can substitute it for something else?? Thanks so much!!! You could make do with olive oil. I was actually able to find the sesame oil after work yesterday! I made the slow cooker teriyaki chicken last night (which tasted amazing!!!!) and the rice. So I will be putting it all together to make the chicken fried rice tonight. I can’t wait!! What a great, flavorful,simple recipe! I live in the middle of nowhere and no one will deliver to my house, so I have been missing Chinese takeout. This recipe is a great substitute, thanks for bringing takeout home! You’re welcome! So glad to hear it was helpful for you. Tried this tonight & it got a thumbs up from everyone. Used the slow cooker teriyaki chicken, some of the leftover sauce (thickened), a bit of Chinese five spice & mushrooms instead of carrots. This a great base recipe that you can adjust to your own preferences, but dont omit the sesame oil, that is key to the deep flavor. Thanks so much for the recipe! Made this last night with modifications and it was great! I used my “new” Breville electric wok I just got on eBay. Awesome basic recipe that you can change up. I made two batches to use up all my rice and mixed up the veggies – on the second batch I didn’t have peas left so used bok choy, corn and carrots. I made extra rice the night before, put it in the freezer after it cooled, put in in the fridge the next day, and into the oven’s warming drawer about half an hour before cooking to bring it up to room temp. I cracked two eggs in a bowl first and whisked them with about half a teaspoon of sambal olek, sprayed the wok with cooking spray and cooked them omelette style in the wok and removed. Then cooked the onions in a T of oil until brown, then added more oil and mixed in everything else. For the sauce, I used 1 T oyster sauce, 1 T black soy sauce, 1 T low Na soy sauce, 2T regular soy sauce. I had just been to the asian market so had stocked up on asian cooking goodies! This was a super easy awesome dish. Even a blonde could do it!!! YUM!!! I made this tonight and it was great!! I marinated my chicken in teriyaki sauce first and I added about a half a pkg. of fried rice seasoning mix. Will definitely make this again!! Thanks for the recipe! Made this tonight and it was a big hit with the hubs. Next time, I will definitely scramble the egg separately and reduce the sesame oil by one tablespoon. I’d never cooked with sesame oil before and the flavor was quite potent–good, but potent. I made the better than take out chicken fried rice last night for dinner. My hubby loved it!! :) Three cheers for you Rachel! I made the terriyaki chicken before and added it to the fried rice! It was great!! Thanks! So glad to hear it. I used basmati rice, cooked it in the slow cooker and then dumped it in with the chicken and veggies, and it turned out amazing. I also used garlic butter to cook the carrots and peas in. I also didn’t use the sesame oil either. Only because I didn’t have any. I asked Hubby if this was this was a more than once meal and he said yes and rated it 9.5/10! I found this recipe on pinterest. Great recipe! Not the slow cooker, the rice cooker. Haha. Thanks! That makes me so happy to hear. Just made this…best chicken fried rice EVER! Thank you for sharing! May I recommend adding a touch of Sesame Oil? It adds so much flavor and the aroma is fantastic. Yes, I agree! The recipe calls for this. We made your fried rice and the whole family loved it and it was easy!!! Thanks!! LOVE this recipe, I do make it with the slow cooker teriyaki chicken. I use teriyaki sauce in place of the sugar/soy combination… I find 4 cups of rice is way too much. I had to toss it all together in a huge mixing bowl to be able to mix it at all. I bring this down to 3 cups prepared rice & that works much better for us. Otherwise, EXCELLENT. Mmm. I think I’ll do that. I found you on Pinterest. I just got done making this. It was really good. I did just use a 1/4 cup of the sauce from the chicken receipe you linked this fried rice too, instead of using the soy sauce and brown rice instead and it was sooo good. Yum I look forward to leftovers! We lived in Shanghai for two years and pretty much agree with Rob. it needs to be day old rice, and they cook the egg separately. I was not taught to use sesame oil and don’t really like it, but we did always use a spoonful of rice wine along with the soy sauce. I made this, exactly as the directions said. It was perfect! My husband and kids ate most of it before I could even get to it. The key is the sesame oil. You can use a tablespoon or two of canola or peanut oil to fry with and just add one tablespoon of sesame oil (make sure it is the dark Asian version) when you add the soy sauce. The flavor will be more intense that way. We all loved this! My only modification was to add about a T. of agave nectar with the soy sauce. Probably sounds weird, but I like it! It’s not enough to make it sweet, just more like a soy sauce packet you get with store bought frozen pot stickers! Awesome fried rice, thank you! We substitute the rice with shirataki rice as the no carb version and it’s fantastic! It serves about 6 and I think it would be great for freezing. Has anyone tried freezing this recipe? Also, how many does this feed for a meal? Big thumbs up! I did make a few adjustments for what I had on hand. Fresh broccoli and corn. Brown rice and reduced sodium soy sauce. Great reciepe. Interesting take on Fried Rice… I have done it differently having learned a few secrets from my father who spent many years in the Far East, and a number of other friends who were of Oriental descent. This was not bad for a quickie dish. Hint: try letting the rice cool uncovered in a refrigerator overnight, stirring often to allow to dry somewhat. Then add soy sauce gradually, allowing steam to dissipate each time — allows the flavors to seep in while caramelizing the rice grains. Cook egg separately, cutting fragments, cook veggies and meats the same, adding to rice to reheat along with egg strips. BLING, BLING. Fave Etsy shops include: http://www.etsy.com/shop/moxieandoliver and http://www.etsy.com/shop/WryAndGinger. Thanks so much for the giveaway and your great blog, Rachel. Tonight, my son and I will make BTT chicken fried rice – yum. Found you on pinterest…made this tonight. Yum!!! Love it! Thanks! One less recipe that I have to go out for! I can support that! Much healthier too. This was SO good. I halved the recipe because I’m only cooking for one, and it was perfect! Thank you so much, this will definitely be a regular item! My mom used to make something like this for us when I was little, now I can make it myself!! 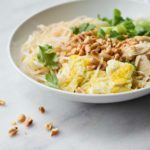 I’d probably add some water chestnuts and maybe some bean sprouts, but this is a great recipe, thanks for sharing!! You’re welcome! Great ideas for other ingredients, too. This is a really versatile dish. Hey Rachel, I just wanted to say I love your blog! I made your teriyaki chicken today for the chicken fried rice, both are amazing, and I’m making your slow cooker Italian chicken recipe which looks wonderful later this week! Keep it up! Thanks Amanda! So glad for the support. Sprinkle some chicken boullion granules at the last minute and slightly stir. I learned this from a Japanese friend and it’s great! Neat! Way more authentic than I am capable of being. This was Ahh-mazing! Big hit! I doubled everything to make a bigger portion.Everything went! My son couldn’t believe we made this at home! Yes! So glad to hear it. Thanks Jennifer. Anyone know of any substitute for soy sauce? I am allergic to it and prefer to stay away! Otherwise the reciepe sounds amazing and we really want to try it tomorrow for dinner! I’ve heard of this soy sauce subsitute but never tried it. Hope it helps. Can’t wait to try this during the week,just wish i could hit the print button rather than having to copy it on paper. We are working on one! Thanks for the feedback. It really helps. Just copy & paste to the notepad and u can print it from there. Takes about 3 seconds. We actually recently added a printer friendly button. Hope that helps! I understand the hassle of the previous set up. I’m so excited to try this!! I make broccoli beef or bourbon chicken a few times a month and always buy takeout rice! I think when I make it though I’m gonna sub the meat for a bag of frozen stir-fry veggies :-) I love love love the lil baby corn lol!! We do this with bacon! And the ginger is just a little bit, like 1/2 tsp. This looks really good! Do you happen to have a recipe for the take out vegetable Lo Mein noodles? I do not! Maybe that could be in the works. Thanks for the suggestion. Always being pressed for time and having hungry mouths waiting, I discovered a shortcut in making this Fried Rice without compromising the taste. The new frozen rices that are now available in the supermarket’s freezer section work perfectly in this recipe. I have made this recipe several times now, substituting 1 pkg. plain white rice and 1 pkg. vegetable rice for the cooked rice and peas and carrots. To make it a bit healthier, try using one frozen brown rice and one vegetable rice…sooo good! Sure saves a lot of preparation time too! Try it !!!! I just have to say that this is awesome! I made it today and wow, very tasty!! Yum! I’m ratting it now!!!! Thank u for sharing this! It looks really good. I could not find a print button for this recipe. Great, easy recipe. Plus, the ingredients are stuff I usually have on hand, so it’s a great dinner in a pinch. Thanks for sharing the recipe! You’re welcome, Marny! Thanks for reading. That was an awesome recipe! Thanks for sharing. By the way, I used brown rice and it tasted really good. We had plenty of left overs for the next day. Looking forward to having it again. How healthy of you! Great suggestion. Thanks. making for dinner :) Yummy It will be perfect for my 16 month old and 5 year old! Made this for lunch — delicious! Used fresh veggies from the garden, and added some celery. Found your blog from this recipe on Pinterest and we are making it tonight! Thanks! Hope it doesn’t disappoint! Thanks for reading. I plan to make this later in the week with leftover pork loin. My aunt gave me a similar recipe, and she said that if you are using just-cooked rice, put it in a casserole dish in the oven while cooking the veggies and eggs to dry it out a bit so that it doesn’t become mushy. I’m going to try that. GREAT tip! Others have said using day old rice, but that is perfect when you want it now! Thanks for reading and your comment, Carissa! Great tip! That’s a perfect instant fix for getting the tasty day old rice texture. Thanks for commenting. I add fresh ginger and garlic that I add to flavor the oil. I also scramble the eggs ahead of time with some soy sauce. Oh, and a couple of spring onions over the top at service really kicks up the flavor. I’ve also been known to add bok choy, napa cabbage, a can of water chestnuts, sesame seeds…whatever strikes my fancy or that i have hanging in the fridge. i just saute’ the cabbage along with the other veg. GREAT additions. Thanks so much for the comment. You’ve got my wheels churning. Just made this and all I can say is…”how easy!!”. I had everything in my house already, cooked the rice at breakfast and then mixed it all together at lunch. Ps-I was lazy and didnt want to cook the chicken, but will make again and try with. So happy to hear it, Tracy! Glad you enjoyed it. Thanks for reading and your comment. Oh! And I omitted the chicken bc I didn’t have any.. Still soooo good!! Tried this!! Amazing!!! Thanks!!! It was so easy too!!!! I made this last week for my boyfriend of 6 months. It was the first time that I’ve cooked for him, and now I think I’ll be doing a lot more cooking! This recipe is amazing. As you suggested, I made the slow cooker teriyaki chicken to go into the fried rice. I can’t believe how easy this was to make. I also made homemade fortune cookies for dessert. I’ll definitely be trying more of your recipes! Yay! They say a way to a man’s heart is through his stomach. Homemade fortune cookies?? You MUST give me the recipe! my daughter asked for seconds. My husband said we will never get take out Chinese again! Thank you for the awesome recipe!!! That makes me so happy! I’m can’t stop smiling. Thanks for you comment. Sometimes peas are gross to me too. I can’t eat them often or I’m really sick of them! Great suggestions. Thanks for the comment. Ohhhh good idea with the chili sauce!!! Made it and love it! I made it a little more semi-homemade by using Rotisserie Teriyaki chicken and Teriyaki Rice-A-Roni. It was delicious! Thank you! Great meal plan tips! I liked it better on the second day too. Thanks for reading! THIS is what’s for dinner tonight! I didn’t have frozen veggies so I used fresh carrots and celery instead of peas. YUM! Mmm bacon. Sounds yummy. Thanks for reading! I don’t have a bag of carrots and peas, so will be using mixed vegetables instead. Very resourceful! Thanks for commenting. Hope it turns out well. My child is allergic to eggs. If I don’t include the eggs, will it ruin the recipe? Thanks! Nope, it should be just fine without eggs. Thanks for reading! Great tip. I’d heard that before, but its good to know it’s true! Thanks for sharing it. Just finished dinner and everyone, my husband and two daughters, loved it. Thank you! That’s great, Cyndi! So glad I could be of service :) Thanks for reading. i made this last night and oh my!!! so good…my 2 yr old has this weird thing that when he likes something he tastes he likes to eat it very slowly and he loved it. Aw, how cute! So glad to hear it. Thanks for reading! I made this and it was delicious! Thanks for sharing :) it might need some bacon though! I saw a recipe re-do someone did from this where they DID wrap it in bacon. Great idea! Thanks for reading. Have you ever used the olive oil instead of sesame? I also don’t have sesame oil and I am worried it will take away from the flavor. No worries! I’ve used olive oil before and it was yummy. Thanks for the question. Great tip! Thanks for sharing Melinda. I like the Thai variation. I used to make this when my sons were young and they loved it! Any leftover meat can be used. I don’t have sesame oil. Can I substitute anything for it? Olive oil should do the trick! Just made this….simple and delish dish, no need to say more! Thanks Norma! So glad you liked it. Thanks for reading. I will be making this tomorrow night for dinner. Thanks! You’re welcome! Hope it turns out perfectly. I just made this for our supper tonight and it is YUMMY! I love Chinese take out, and now I can re-create it at home. I love browsing your recipes, thank you for posting so many delicious things. Looking forward to more recipes in the future! This looks like a chicken fried rice I use to make my son and I’ve lost my knack but I’ll start using this one to see if it’s the same! Okay! Maybe you’ll remember some of your old tricks and can help me make this one better. Thanks for reading. I have a recipe that also adds minced ginger. It gives it a very authentic flavor. Unfortunately I’m not sure of the quantity…..